Nelson Eddy was not a “singing capon” despite the sneers and jeers of his critics. In fact, he he was very human and it was never more visibly apparent than in the 1938 film, The Girl of the Golden West. This was his 4th film with Jeanette MacDonald but the first one after her marriage to Gene Raymond. She had married in June 1937 and after the summer ended, it was time for her to get back to work and appease their fans still angry over her wedding. That it was going to be difficult for them to work together was a given. Nelson was still pining over her and despite his many affairs (“about a dozen” per his own statement), he was miserable. He drank to ease his pain and to get through the filming without breaking down in tears on set as he had done during Maytime. 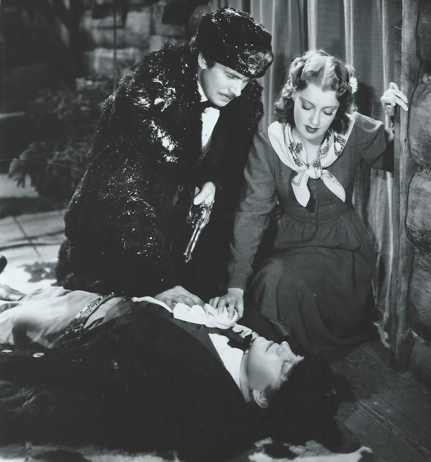 In this film, Nelson’s character is shot and badly wounded. 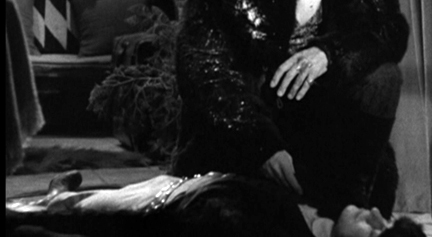 Jeanette’s character plays a crooked hand of cards in an effort to save his life, by offering herself as compensation to the sheriff (played by Walter Pidgeon). The scene in question had Jeanette pushing Nelson up an attic staircase to hide, her helping him down again and his collapsing on the floor, with her anxiously and tenderly ministering to him. …and an actual screenshot as the scene progresses. Yes, Nelson was indeed a lively near-corpse and it’s astonishing that this sequence was left in the film as-is. Not to ruin the plot for those of you who haven’t seen the film…but of course Nelson survives, he and Jeanette are reunited at the very end and head off in a covered wagon singing happily of their love. Which is what sort of happened in real life by the time The Girl of the Golden West finished filming. Thanks Maria and Katie for help with the photos for this article.